Egg drop soup is my rainy day food. It’s my go-to comfort food for sick days, lazy days and actual rainy days. Though if we made it every rainy day where we live I’d be more soup than girl at this point – but you get what I mean. It’s the kind of soup that warms your from the inside out and it’s one everyone should know how to make. 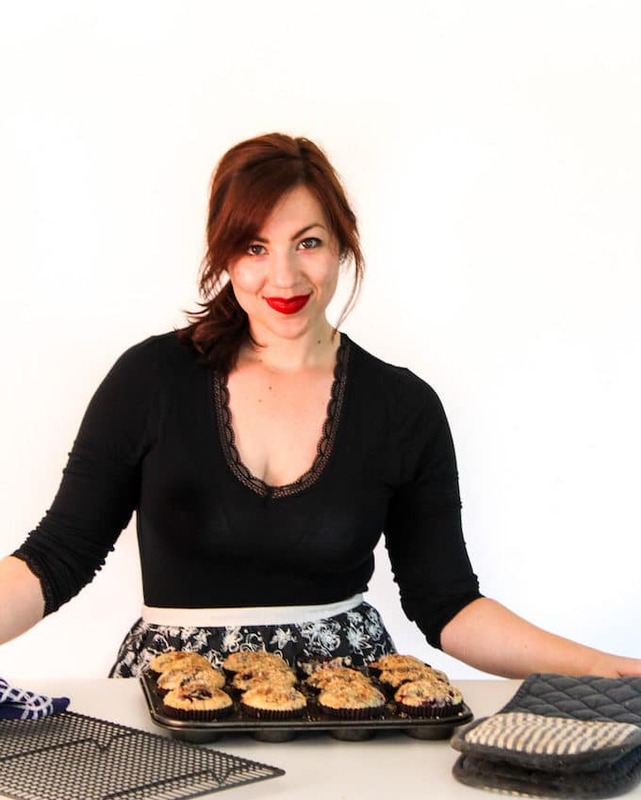 Chances are you even have everything needed to make this in your kitchen right now! Altogether this dish is suuuuuper easy to make. It’s made up of only 8 ingredients (though really only 3 or 4 of them are essential) and can be ready in under 20 minutes. chicken stock – I don’t recommend a low sodium stock because the saltiness of your broth is your main flavour here. Let your broth cook and come to a boil. As it’s cooking you can move on to prep your starch water mixture and whisk your eggs. Since this soup cooks up fast it helps to have everything prepped and ready to go as and when you need it. When it comes to the starch, you have a few options. I’ve made this with arrowroot, tapioca and cornstarch. Keep in mind the first two will keep this paleo friendly so use either of those if you’re trying to avoid grains. You can also ditch the starch altogether, but you’ll be missing out on a couple of benefits here. Adding starch makes for a silkier, more full-bodied broth. It’s a lot more akin to something you’d order from a Chinese restaurant than something made at home. A starchy broth also prevents the eggs from going rubbery. The starch delays protein connections which overall prevents the eggs from getting all rubbery. 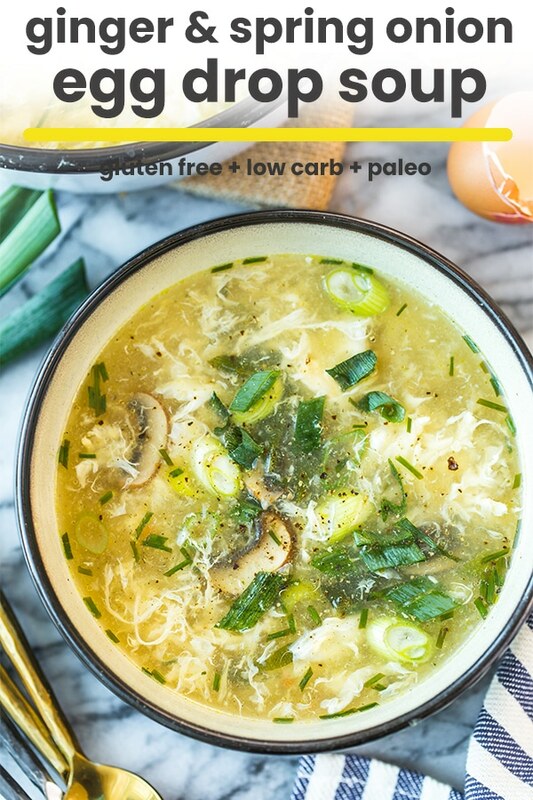 Having made this soup a million times with and without starch I noticed a big improvement to my egg drop soup when I started adding starch to the mix. After your brothy base has come to a boil stir in your starchy water mixture. Make sure to whisk out all lumps before adding it to the hot broth. Once added let the broth cook another minute or two. You might notice a very subtle thickening of the broth. Bring the mixture to a boil once more too add the eggs. Slowly drizzle in the eggs while you stir the soup with a fork or spoon. The eggs should cook almost as soon as it touches the broth. If it doesn’t you may need to increase them temperature before adding any more egg. Finally, stir in your black pepper and a splash of sesame oil for good measure. Taste and season your soup with a additional salt if needed and that’s it! Whisk your water and starch together separately from the stock with cold water. If you add the starch to hot water without it being fully mixed it will end up lumpy and you’ll really struggle to mix it in fully. Make sure your soup is boiling when you begin drizzling the eggs so that they cook almost as soon as they hit the water. Drizzle in your whisked eggs slowly – don’t just pour them in all at once or you’ll end up with lumps of eggs as opposed to silky ribbons throughout your soup. 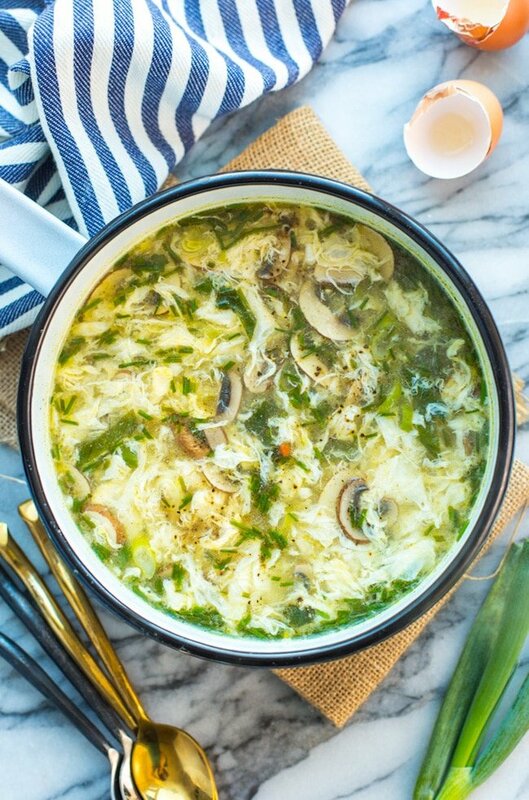 Don’t forget to #asaucykitchen on instagram if you try this Ginger and Spring Onion Egg Drop Soup! We love seeing what you make! You can also post your pictures to my facebook page! Mix together 1/4 cup water together with the 1 tablespoon arrowroot starch. Whisk together until no lumps remain. Set aside. In a medium sized pot add the stock with the ginger, spring onions, mushrooms and black pepper. Stir and bring to a boil. Once boiling stir in the chicken stock + arrowroot mixture until combined and cook 1-2 minutes. The broth should become thicker and silkier after adding the starch. While the broth is cooking whisk your eggs. Slowly begin pouring the eggs into the soup. As you pour slowly stir the broth with a fork to create ribbons from the eggs and prevent clumping. Keep stirring another 30 seconds to fully cook. Top with black pepper and sesame oil. Taste and season with salt if needed. Serve hot. *Make sure to use arrowroot or tapioca starch if you're avoiding grains. Make it Low FODMAP: Leave out the mushrooms, only use the green parts of the spring onion and make sure to use a FODMAP friendly chicken stock. Make it Vegetarian: Use a vegetable stock. This soup is best served hot and fresh. You can keep if for a day in the fridge but any longer than that and the eggs will start to feel rubbery. Egg drop soup gets it's saltiness mostly from it's broth. If you use a low sodium or a homemade stock you'll need to add additional salt to taste to make up for it. You can also add a couple of teaspoons of soy sauce (gluten free if needed) for added saltiness. This was so yummy! Will be making this many more times in the future! Thank you! Thanks Erin! So glad you liked it! Thanks so much for coming back to let me know what you thought! I have a feeling this will be a big favorite here as well! Once the weather turns, I start making soups at least a couple times a week. This is definitely going on the menu. Pinning! Thanks, Michelle! I’m so excited for soup season as well. We’re almost there, but not fully. Once we are I’m just like you and it’s soups galore. It’s so easy – you’re going to love it.Thanks, Becky! Thanks for joing us at #SaucySaturdays!! Thank you! Chicken is always a good addition – that and shrimp if you like shrimp! And it was my pleasure – will def be back again! Thanks, Jerusha! It’s my go to for upset stomaches, so I hope it helps yours as much as it does for us! I’ve been drooling over this soup for the last couple of days! I’m actually not a soup person but this just looks so good. I’m probably craving anti-inflammatory anything after this crazy summer. Wonderful to see you at #SaucySaturdays. Thanks for joining us. Aww, thanks Christine! And it was my pleasure – I’ll definitely be back! Oh this looks delicious, so warming and yet so fresh. 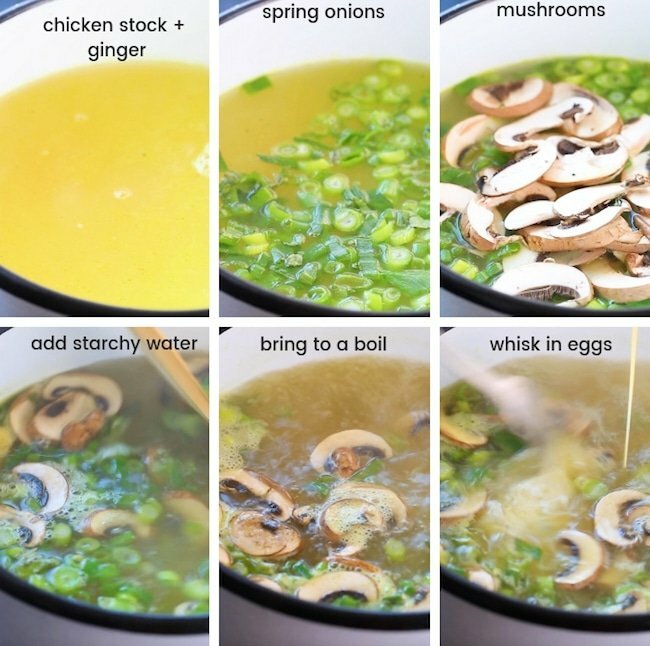 The soup looks delicious and great for the approaching winters = yummmm! Thanks, Molly! One of my favorite things about winter is that I get to make and enjoy soups like this – so comforting! This looks so gorgeous! AND tasty! I love egg drop soup. Thanks, Sara! 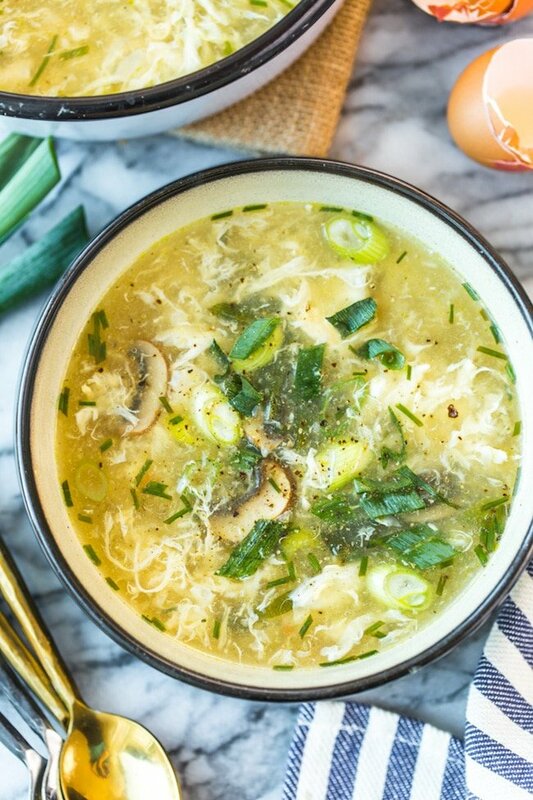 Egg drop soup has always been a favorite of mine – it’s just so tasty! So happy to hear that all your hard work is leading to greater health!! I’m totally with you on soup and soup weather! There’s nothing more comforting. I grew up with ginger – there’s nothing more warming, and with these zoodles! Perfect! Ginger is one of those ingredients that I never realized I liked until this last year, and now I just can’t get enough of it – so amazing! And thank you! So glad to know that we’re actually getting somewhere! This is the perfect recipe for me to make here as it has just turned Spring in Australia! So light and delicious and the combination of ginger and spring onions sounds divine. Thanks, Thalia! I hope you have a good Spring! How wonderful to get some good heath new! This soup looks delicious and although we’re now heading into the warmer weather I think it’s the perfect meal for the cool spring nights. Thanks so much for linking up with us for Fabulous Foodie Fridays, have a great weekend! This looks wonderful Sarah, I’m just upset that I’m out of coconut aminos right now. I will definitely give this soup a try as I have a weakness for all things ginger. Thanks, Charlene! I hate when I’m out of coconut aminos! They are such a life saver, aren’t they! Exactly! It’s comfort in a bowl! Thanks, Kathryn! Sweater weather and soup all the way!